The Relay secure smartphone for kids by Republic Wireless is so secure that it does not feature a display. 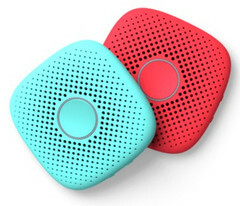 This accessory can be considered a basic phone with tracking capabilities for kids, as it features nationwide 4G LTE connectivity, as well as WiFi, Bluetooth, integrated GPS, NFC contact sharing, and even a smart assistant. Republic Wireless has just introduced a new accessory for kids up to 12 years of age that might be able to replace the traditional approach used by many parents who simply give their old phones to the children when upgrading. While even older smartphones can provide a lot of distractions to kids, the Relay keeps everything to a bare minimum - no display, a waterproof design, a virtual assistant (not available yet, but coming soon), as well as 4G LTE and an internal GPS. Described as a "smart, secure, and easy to use" device, the Relay works like a walkie-talkie and features a front-facing speaker and dual mics, as well as a 3.5 mm audio jack. In addition to the nationwide 4G LTE coverage, it also comes with WiFi 802.11 b/g/n and Bluetooth 4.1 LE, NFC contact sharing, and integrated GPS location tracking. The button on its face is surrounded by a LED notification ring. Weighing just 0.15 pounds, Republic's Relay only measures 2.68 x 2. 68 x 0.57 inches and comes in blueberry, charcoal, mint, slate, or brick finish. A single one has a price of US$99, The Starter Pack delivers two for US$149, and The Fun Pack that consists of three Relays can be acquired for US$199. In all cases, there is a US$6.99 monthly service fee that needs to be paid for each Relay. The Relay by Republic is covered by a one-year limited warranty and comes with a 30-day money back guarantee. For a closer look at what should be expected from these accessories, those interested should spare a few minutes to check the movie below.